It’s been quite some time since the Facebook Security Team launched the Facebook Anti-Virus Marketplace to protect Facebook Users both on and off Facebook. Facebook Security partnered with popular antivirus brands like Microsoft, McAfee, TrendMicro, Sophos, and Symantec to make the web a safe place to browse. That was back then. Facebook Security has come a long way ever since. Recently, they announced partnership with 7 more industrial security brands – avast!, AVG, Avira, Kaspersky, Panda, Total Defense, and Webroot making the Facebook experience more secure for its 1 billion plus users. 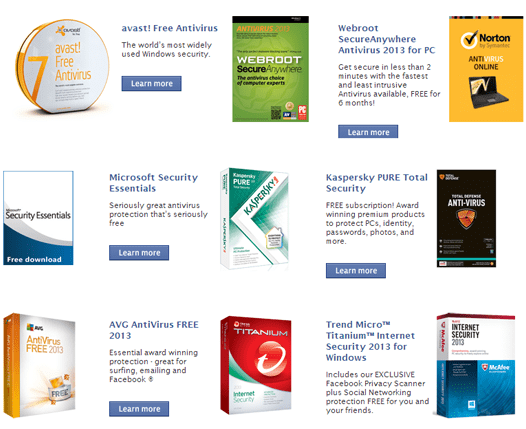 2 The AV Marketplace: Free antivirus for six months! The Facebook Security team develops and maintains sophisticated defense system to against viruses, spam, phishing attacks and other malicious threats. They have an automated enforcement mechanism that can detect and block accounts, pages or apps that poses a threat to security. Facebook Security maintains a URL blacklist system that tracks and blocks malicious links. The database of blacklisted URLs is obtained from the security partners. The Facebook users are protected by the combined intelligence of major Anti-Viruses. Facebook Security protects users from being redirected to phishing links with the program they call “Link Shim”. Each time a link is clicked on Facebook, the system first checks it against a list of malicious links provided by the security partners and ensures that the link is safe. Additionally, it also modifies URLs so that any links directing in or out of Facebook is monitored correctly. For more information on Link Shim, read the following note. The AV Marketplace: Free antivirus for six months! The AV Marketplace was created with the mission to let Facebook users stay protected even when they are offline. Thanks to the AV Marketplace and Facebook Security’s partnership with the major companies, the Community of over 1 billion Facebook users is now protected by a security system enhanced by their combined intelligence, URL blacklisting, and the antivirus products themselves. The AV Marketplace offers Facebook users free licenses to anti-viruses from the 12 security partners for full six months. This means you can have paid versions of popular anti-virus programs free for six months. Antiviruses are provided for PC, Mac and Mobile. However, only one product per category for each use is allowed. So, if you have already downloaded an antivirus product from the PC Category of the AV Marketplace, you cannot download any other PC antivirus. So make sure you decide well on which antivirus to go for before downloading it. Facebook Security is doing their job well in protecting its users. Make sure you are taking the advantage of being a Facebook user by availing your own six-month antivirus subscription. Get your favorite antivirus for 6 months!